Studio Creations were fantastic to work with from start to finish. Our recording studio is attached to our house, and both were being built at the same time. Studio Creations worked with our builders to ensure that their design was constructed to their high specifications. The lines of communication were open at all times, which helped us out incredibly. Once the shell was constructed, Studio Creation’s team came in to complete the acoustic fit-out. The team was great to deal with, and we are extremely happy with the end product. 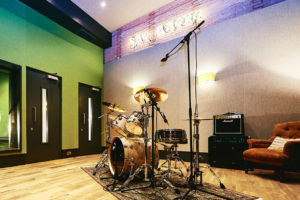 We knew what equipment we wanted in in our studio and Studio Creations were able to source the best possible deals for us and installation was done to a very high standard. We had a design and a very clear vision of what we wanted our studio to look like, Studio Creations made it a reality, which surpassed our imagination. Studio Creations continue to offer their support, and we would highly recommend their services. Steve & Lindsey, The Anexe, Exeter, UK.